I don't know how many mushroom species are hiding out under the name "Lyophyllum decastes," but it wouldn't surprise me to find out there are several. Just flip through your field guides and take a look at the pictures. 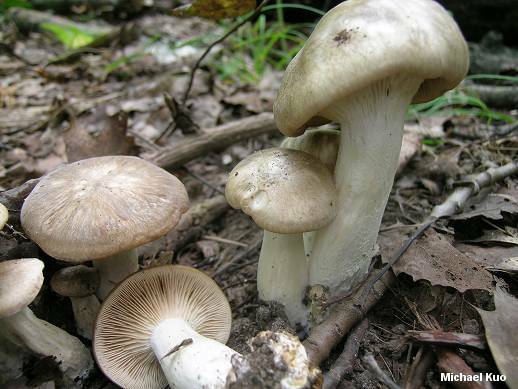 Then again, if we have learned anything from DNA studies of mushrooms we have learned that the physical features of mushrooms (for example the color of the cap) are not necessarily indicative of meaningful genetic difference--so it may be the case that there is only one species involved. 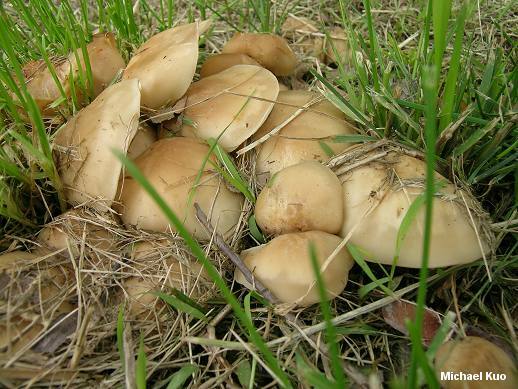 Growth in dense (and often huge) clusters on the ground, usually in areas where the ground has been disturbed (roadbeds, paths, landscaping areas, etc.) but sometimes in woods. A pure white spore print. Absence of a partial veil or universal veil. 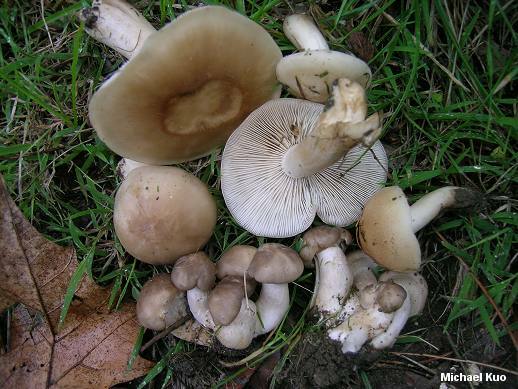 A medium-sized cap that is whitish, brownish, yellowish brown, or grayish brown. Gills that are white but may yellow somewhat in age. Spores that are inamyloid, unornamented, and more or less round. Gill faces and edges that lack cystidia. Basidia that display granular contents when treated with acetocarmine. If you have matched all of these characters, you can be pretty sure you have found a member of the Lyophyllum decastes species group. Yes, that's ridiculous--but my point is that Lyophyllum decastes is not as easliy identified as field guides often lead one to believe! For those seeking more precision, a key to four species in the group can be found below. 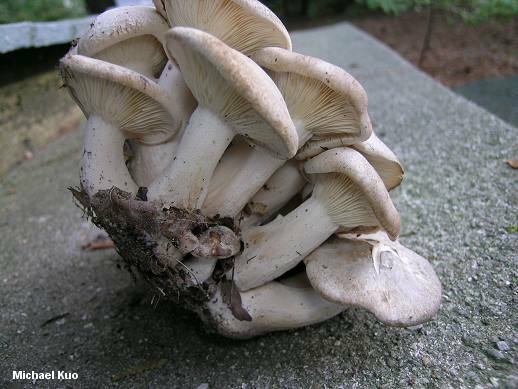 Ecology: Saprobic; usually growing in dense clusters in disturbed soil (roadbeds, paths, landscaping areas, and so on), or occasionally growing alone or scattered (and sometimes occurring in woods); summer and fall (fall through spring on the West Coast); widely distributed in North America. 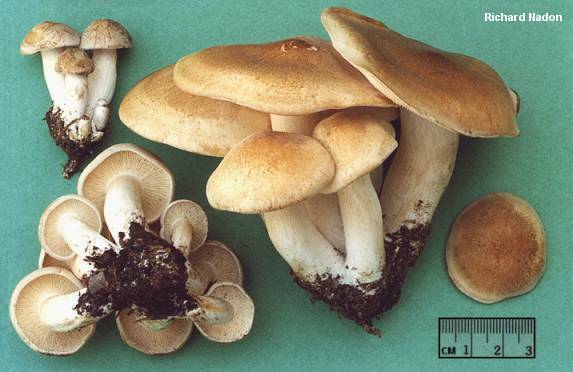 Cap: 3-12 cm; convex, becoming broadly convex or flat; moist (but not slimy) when fresh; smooth; grayish brown to yellowish brown or brown (usually darker when young); often somewhat streaked in appearance; the margin inrolled at first, later even, lobed, or upturned. 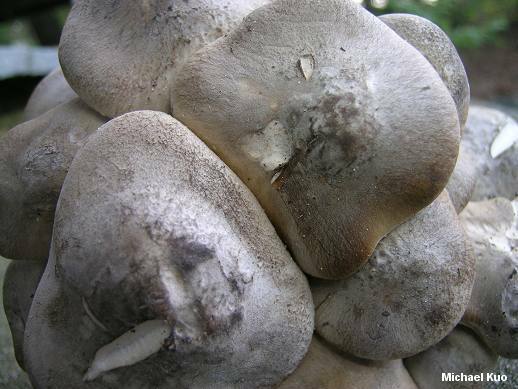 Gills: Attachment variable (attached to the stem, sometimes by a notch, or beginning to run down it); close; white, sometimes yellowing somewhat with age. 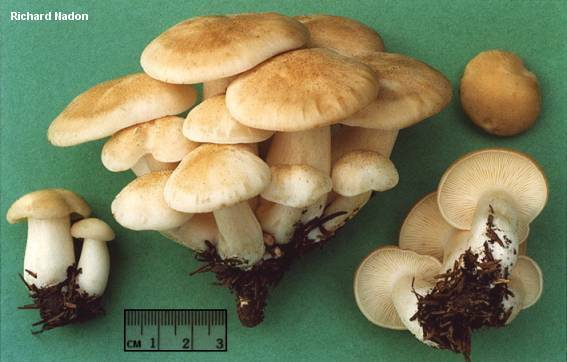 Stem: 5-10 cm long; up to 2 cm thick; smooth; more or less equal; dry; whitish, sometimes becoming brownish toward the base. Flesh: White; firm; not changing on exposure. Odor and Taste: Taste pleasant and mild, or faintly radish-like; odor not distinctive or somewhat fragrant. Microscopic Features: Spores 4-6 µ; round or nearly so; smooth; inamyloid. Cystidia absent. Basidia with siderophilous granules when mounted in acetocarmine. Clamp connections present. REFERENCES: (Fries, 1818) Singer, 1951. (Fries, 1821; Saccardo, 1887; Kauffman, 1918; Smith, 1975; Smith, Smith & Weber, 1979; Arora, 1986; Phillips, 1991/2005; Lincoff, 1992; Barron, 1999; Roody, 2003; McNeil, 2006; Miller & Miller, 2006; Kuo, 2007; Trudell & Ammirati, 2009.) Herb. Kuo 09110406, 01130516, 09110514, 05140601, 11110701 (WW). 1. Cap white; spores ellipsoid (6-7 x 3.5-4 µ). 1. Cap more highly colored; spores round or nearly so. 2. Cap hard and cartilaginous (snapping when broken), with a sturdy and thick cuticle. 2. Cap softer than above; cuticle not especially thick. 3. Cap surface with innate fibers; odor mealy. 3. Cap surface bald; odor not distinctive.